How should I hang my triptych? 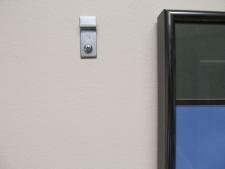 What is the easiest way to hang multiple part photographs so they stay straight on the wall? Keeping your artwork level and lined up can be a challenge, especially if it involves several frames hanging side by side (like a triptych). Each frame comes with a wire on the back for hanging (and these wires are adjustable). I find it much easier, though, to hang the photos on "security hanger" brackets screwed to the wall, two to a frame. I make sure that the brackets are all even and level, and the frames will hang perfectly. If you allow a little space, you can even adjust the spacing between the images whenever you wish. 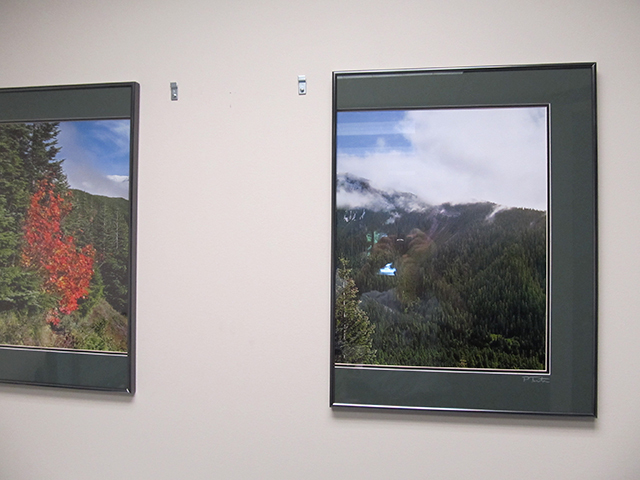 When I hang the multiple part photographs, I usually leave a space between them of about a quarter to half an inch. This would preserve the spacing I allowed when I printed the images. However, You may hang with any spacing you wish. Some people even put the pieces on different walls. If you like, I can mat and frame them as individual photos. These measurements will allow for the frames to be positioned anywhere from touching one another to about 2 inches apart. If you wish for the frames to be further apart, the two outside hangers on each side need to be moved out from center the appropriate amount. If you live within 30 minutes of downtown Portland, we can deliver and install the multiple part photos for you for the same charge as shipping. You can check out our selection of triptych photographs on out "Triptych Page". We also have five part sets on our "Five Part Page".